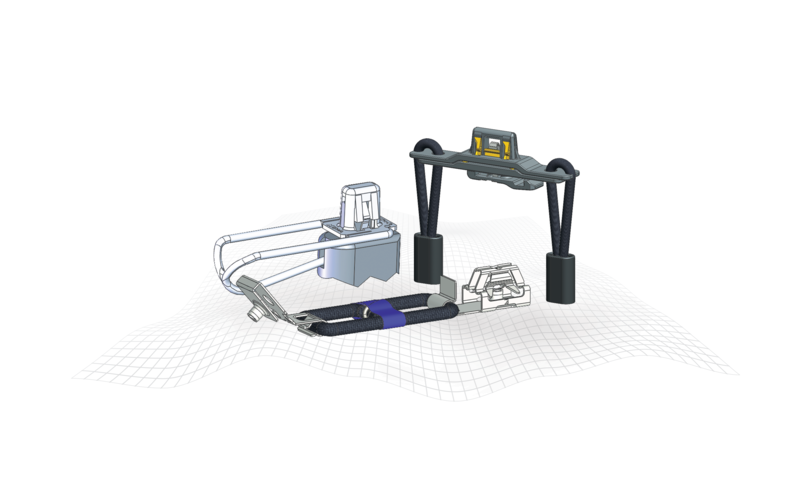 LOW INSERTION AND A WIDE RANGE OF CONTROLLED EXTRACTION FORCES. 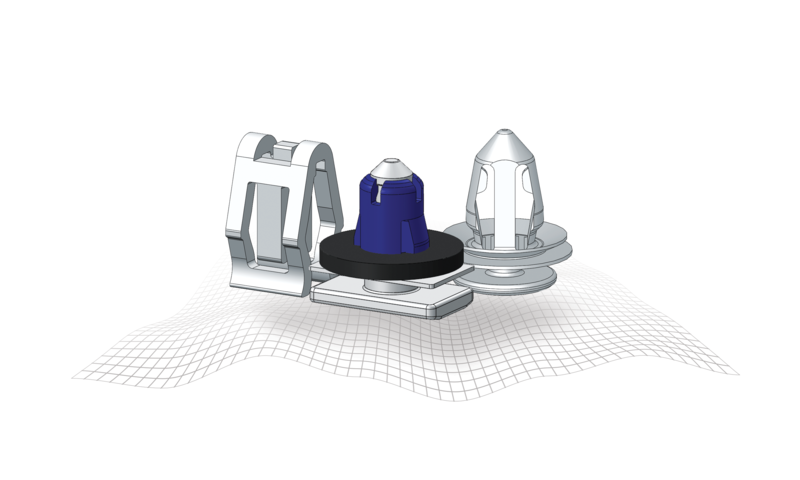 Termax’s U-Based Fasteners will provide you with a robust engineering solution for all your fastening needs. 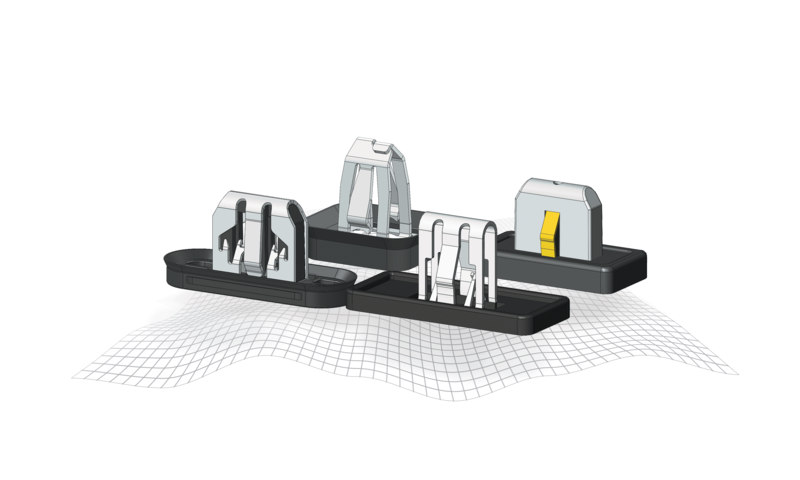 Clips are available in a variety of “set-up heights”, sizes and configurations. Termax U-Based Fasteners offer low insertion and a wide range of controlled extraction forces. 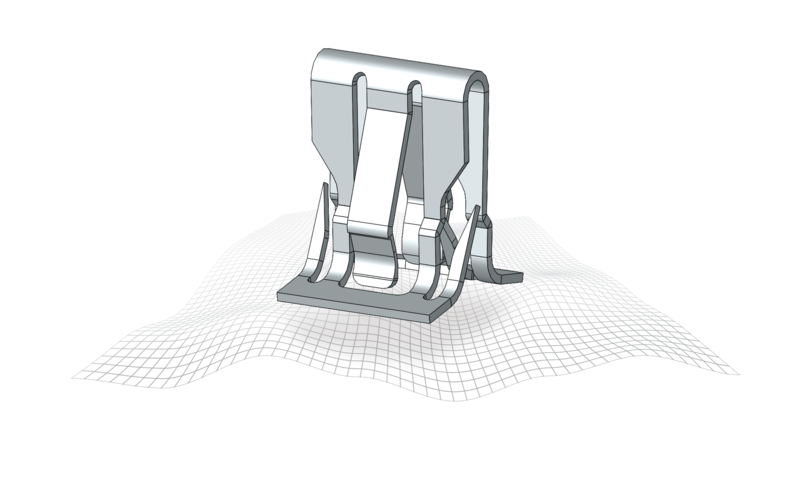 Termax's unique "coining" process is applied to the wings of the clip providing lower insertiom efforts and additional control efforts. Termax U-Based Fasteners are designed with aggressive barbs. These barbs have excellent retention to a wide variety of materials. Termax’s ability to control extraction efforts (via coining), gives you options without changing your tools. Instead, Termax can offer you essentially the same clip with a modified coin that increases or decreases the extraction efforts. UTILIZED ON PILLAR TRIM, OVERHEAD CONSOLES, "TIP" PINS, HEALINERS, AND TO REINFORCE DURING AIRBAG DEPLOYMENT. Termax’s High Retention Clips will provide you with a robust engineering solution for your high retention needs. Clips are available in a variety of “set-up heights” and “foot-prints”. Eliminates the concern of the screw backing out over time. By taking two thickness of metal and toy tabbing them together at the top of the part, Termax has created the most robust high retention clip in the industry. Removal of the fastener from the slot can be accomplished by “pinching” the opposing tabs together. AN INDUSTRY FIRST! The two-winged design provides lower insertion efforts while retaining high extraction values. Two-wings also reduces the opportunity for a partial installation that is inherent with the conventional four-winged design. FASTENERS THAT UTILIZE ALL TYPES OF MATERIALS TO SOLVE CHANGES. Termax’s Water Seal Clips provide the complete dust, air and water seal fastener that you were looking for, without the foam gaskets! The unique proprietary design allows you to attach your part while not having to worry about dust, air or water intrusion. These clips are offered in various sizes, materials, orientations, styles and “set-up heights”. Creates a high retention attachment (rated to over 300lbs.) that is water proof. A plastic overmold allows the clip to be “filled” with rubber - even behind the wings - to seal out dust, air and water. Termax’s unique “coining” process is applied to the wings of the clip, providing lower insertion efforts and additional control efforts. 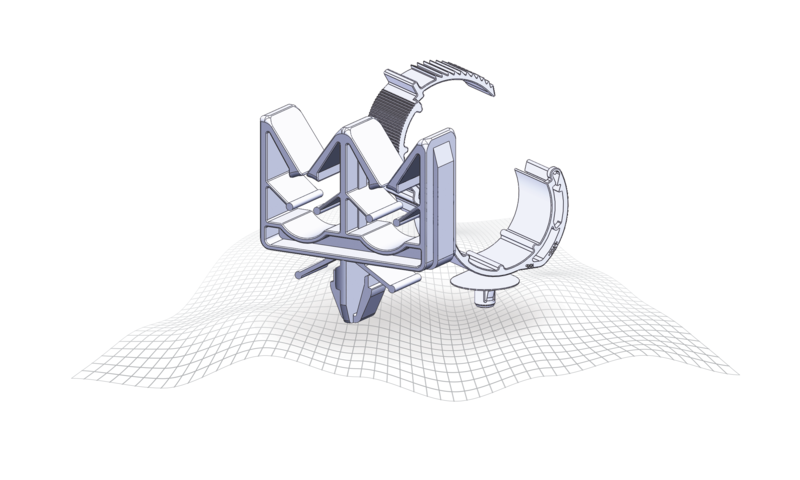 MADE FOR FLEXIBILITY, ATTACHES TO YOUR PART IN A VARIETY OF WAYS PROVIDING A VARIETY OF ENGINEERING SOLUTIONS. Termax’s plastic fasteners are reliable, dependable and proven solutions. A wide variety of styles are available; from small Arrowhead clips to large Arrowhead clips; from conventional birds beak clips to cutting edge technology birds beak clips. 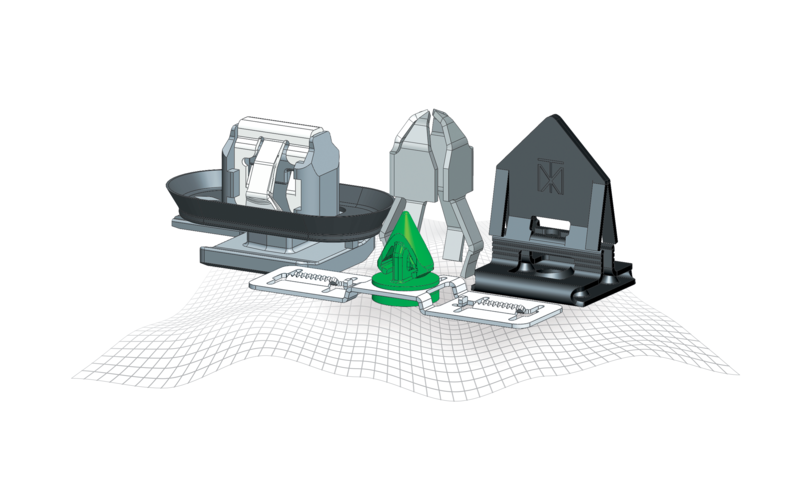 Termax plastic fasteners attach to your part in a variety of ways providing a variety of engineering solutions. Termax offers Birds Beak Fasteners with conventional tips as well as the“Energy Absorbing” tips. 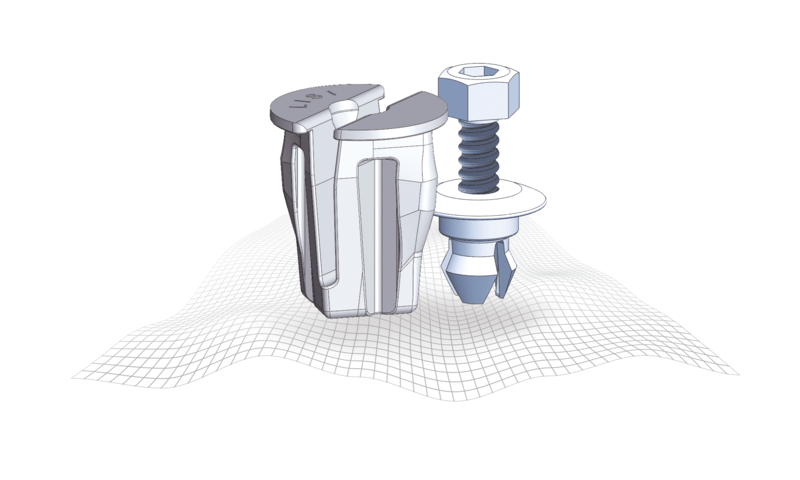 Termax Arrowhead Fasteners are ergonomically friendly, forgiving and very durable. Termax offers Birds Beak Fasteners with tips that absorb and distribute more energy prior to breakage. Termax’s Magnets are designed to be robust and a flexible solution when traditional fastening methods are not possible. Termax Magnets are available in various holding strengths, shapes and sizes. Magnet fasteners provide “zero” insertion efforts while providing a reliable and consistent extraction force. Magnets are the perfect solution when hidden fasteners are required. counteracting BSR’s. 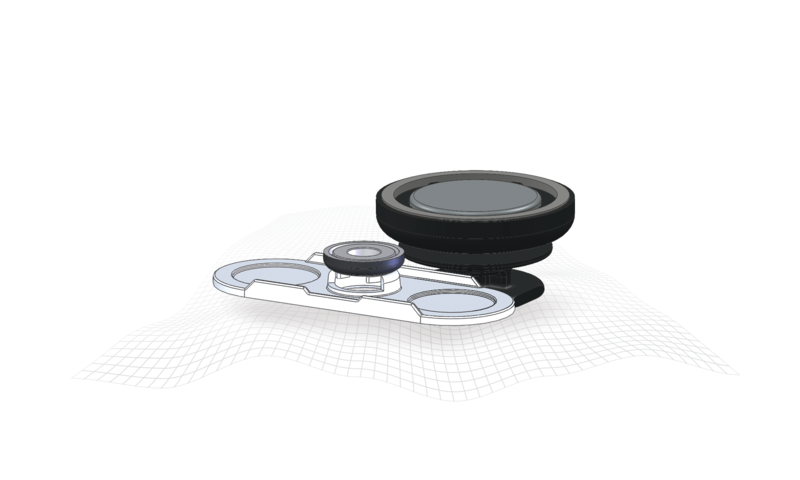 Termax understands the various factors that contribute and are able to minimize them with our overmolded pressfit magnets that have the most BSR countermeasures available. 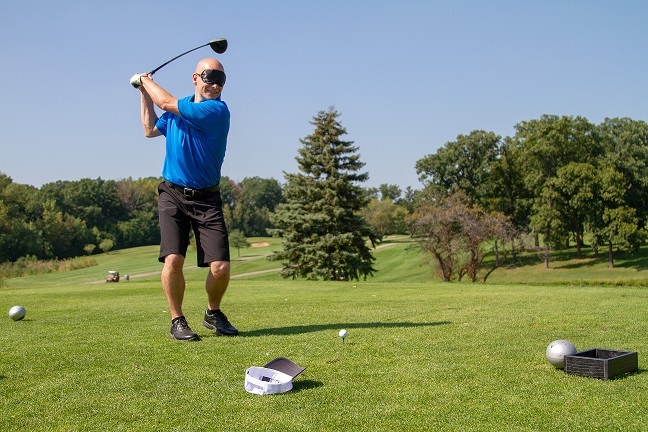 Our experienced team can help you create the carrier that best fits your application. This includes (but is not limited to) glueon carriers, sonic welded carriers, infrared carriers, welded carriers, snap in carriers, turn-lock carriers, etc. An important, but often overlooked, aspect of magnet performance is articulation. Articulation is how much the magnet can rotate on top of the carrier. This is important because it improves holding strength in the car as well as allows for some parallelism variation between the magnet and the sheet-metal. Termax magnets all have articulation and the overmolded pressfit magnets have some of the highest articulation in the industry. Termax’s Tether Clips offer everything you need for vehicle components interfacing with air curtains. Our Tether Clips allow your part to move thus allowing the air curtain to deploy, without becoming a projectile. 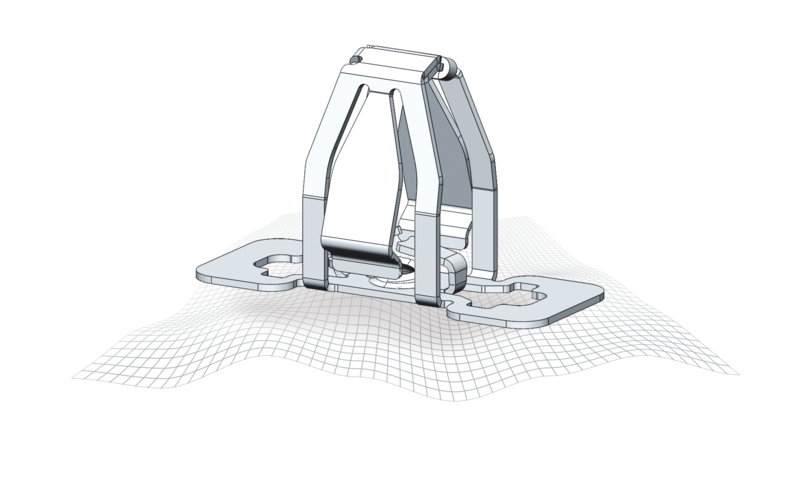 Termax Tether Clips are a proven, reliable, durable and serviceable solution. Tethers are available with various levels of protection and assembly methods. Termax has a wide range of tether lengths we offer for plastic tethers. For bungee tethers, we can customize the length to your application needs. For either style (one or two piece design) the doghouses are common moldable features. during service. Termax Tethers provide a solution that can be serviced without being destructive to the part or the environment. Termax offers one of the largest tether selections in the automotive industry. We provide plastic tethers, bungee tethers, coupled tethers, decoupled tethers, all with different ways to attach them both the trim and to the car. We are excited to offer you a wide selection of U&J Nuts. By combining the experience and product lines of Lisi and Termax, U&J Nuts are available in various thread sizes, shapes, and configurations that cover a variety of applications. Torque features are available as single thread, twin thread, or threaded barrel depending on the torque requirement needed. U&J Nuts are available with retention features to ensure proper engagement with the panel. 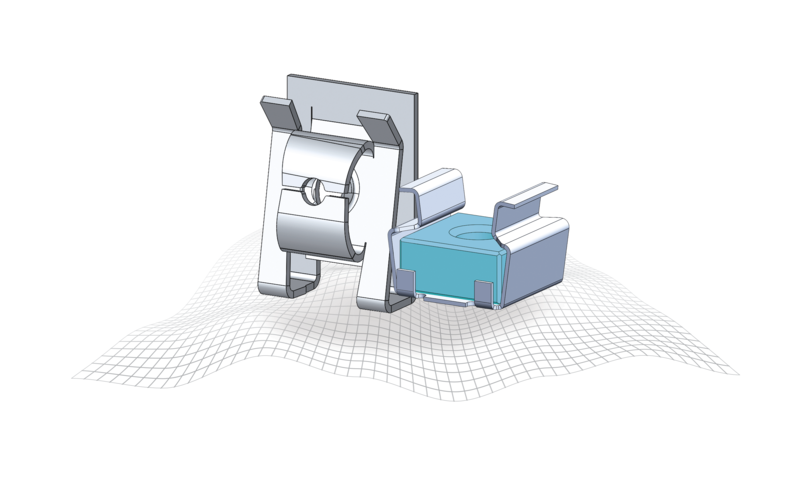 Termax Wire, Cable & Tube Clips are offered in a wide variety of materials, sizes, complexity and configurations. Our experienced and innovative team have developed solutions for a wide range of applications - and developing more all the time. Whether it is an off the shelf solution or a new design, Termax is ready. Variety of plastic clip solutions that are able to attach to many different hole sizes and panel thicknesses. Metal and Plastic clips are available for wires and cables of different quantities as well as different diameters for use across the entire vehicle. Metal clips are designed to arrach to ribs or panels in multiple thicknesses. Termax Plastic Nuts & Rivets are available in many shapes and sizes, depending on the application. Plastic Rivets can encompass a large range of panel thicknesses and hole sizes, as well as varying retention forces. Plastic Nuts are produced in multiple materials suited for different vehicle environments. The wide selection of Plastic Nuts & Rivets allows for flexibility in use all across the vehicle. Plastic nuts are available in sealing and non sealing versions. Sealing nuts will be overmolded with rubber for maximum sealing capability. Rivets have features for removal and service that vary from screw out, pull out, and not removable. Termax is not limited to the specific categories highlighted in this book. We offer fastening solutions ranging from common S-clips to the more unique and customized solutions like one sided clips, barrel clips, U-clips for wide slots and rosettes. If you have a fastening need, Termax can provide your engineering solution. Many of our products started as a custom fastener to address a specific fastening need for our customers. If you do not see what you are looking for, please do not hesitate to call. We would be happy to develop the engineering solution you are looking for!